As many of you know, we here at Backtime are not ashamed of our endless passion for the New York Jets. This is career post #99, so it would be fitting to pay tribute briefly to our own #99, that wacky character from the hey-day of the Sack Exchange. Mark Gastineau wasn't the best player on that defensive line, just the most flamboyant and towed the biggest spotlight. Joe Klecko was in fact the anchor of that line, first as the opposite defensive end, then as a dominant nose tackle when Bud Carson came to town. The 4-time Pro Bowler should be in the Hall-of-Fame. 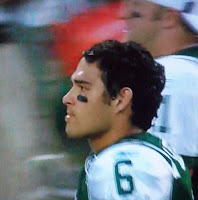 Now, roughly 25 years later, it's the Mark Sanchez era. This segment of Jets history is already defined by a man who hasn't taken a snap for pay. The spotlight follows the latest Southern Californian Golden Boy, but is he really worthy of it? This has to be the most anticipated preseason game in Jets history since...last year. Brett Favre brought a similar circus to town. This year, while the big news was 100 miles south just off the New Jersey turnpike, and while the New York Post ran their exclusive interview with Karen Sypher, it was up to our rookie savior to draw Gotham's attention. Now I have been on the record here. I like Sanchez and I think he has All-Pro potential, but trade 5 guys for him? Come on. Is that the way Patriots operate? Sure enough after a couple of fairly pedestrian Kellen Clemens-led drives and 3 points, Sanchez took the reins deep in his own end. And he hit David Clowney for 48 yards on his first fling. He also found soon-to-be-All-Pro Tight End Dustin Keller a couple of times before Thomas Jones plunged in on 4th-and-1. One drive, one TD. Take a seat. I know you don't want to get anyone important hurt in the first preseason game, but what does Mark Sanchez need most for his development? Reps against an NFL defense, even if it's second and third stringers. Sanchez gets high marks for efficiency and poise. He went 3-for-4 for 88 yards. Certainly nothing to complain about, except we needed to see more. Look at me being impatient. Just like a Jet fan. Is Harrington the Yin to Tiger's Yang? The 2009 PGA Championship: Glory's Last Snooze?